Satellite views show stark differences between the two landscapes: rectilinear, hard lines divide the land inhabited by people, while meandering, unrestrained territories mark the land inhabited by all other creatures. We have, by design, created in contrast to the natural world an artificial world of products, buildings and cities. But what if we were to extract from the natural world, not ore and minerals, but innovative ideas and creative solutions? Enter biomimicry. Described as “the conscious emulation of nature’s genius” by Janine Benyus, author of the seminal book on the topic, biomimicry does exactly that. It is an emerging discipline dedicated to mimicking strategies and principles of the natural world to develop sustainable solutions to human problems. One of the most cited examples of biomimicry is Velcro. Invented by Swiss scientist Georges de Mestral, this system of attachment was inspired by the burdock seed that uses its hooks to attach itself to the coats of roaming animals as a means of travel. This natural Velcro is the burdock plant’s design strategy and mechanism of seed dispersal. Plants and animals adapt to the conditions in which they live through unique and local strategies that have been perfected over millions if not billions of years. Processes of evolution can be seen as processes of design — iterative, based on trial and error, and often ingenious. As I walk into the Sonoran Desert, I am surrounded by organisms that have adapted to the arid conditions of the ecosystem in which they live. 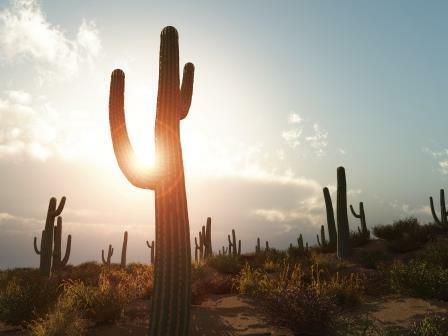 The saguaro cactus, for example, has numerous strategies that it deploys, not to combat the extreme heat, relentless sunshine and limited water supply, but to work with these conditions. Its pleated body expands to absorb moisture, and contracts as it uses up this precious resource. For added benefit, these pleats also offer shade. And because it is impossible to have too much shade in the desert, the spines perform a similar function by creating a lattice of shadows on its surface while also protecting the cactus from predators. Its sap-green body uses every square inch of that surface for photosynthesis. Lying hidden just under the ground is its network of roots, eager and ready to start absorbing moisture when it rains. According to the National Park Service, the average life of a saguaro cactus is 150 to 175 years, and at times some might live 200 years. However, the artificial things that design creates often live extremely short lives. The Environmental Protection Agency estimates the average life of a mobile phone in the U.S. to be approximately 18 months. In 2005, writes Giles Slade, more than 100 million mobile phones were disposed in the U.S. In addition, a report from Nokia revealed that only 3 percent of users recycle their phones. What happens to the ones that end up in the landfill? Lead, cadmium, mercury, lithium and a host of other substances that are toxic to the soil, ground water and human health are likely to leak out of the devices. What happens to a saguaro cactus when it has lived its life? Under the forces of photo- and biodegradation it slowly starts to disintegrate. All the water stored in its tissues oozes out, as an offering to other desert creatures. In its death, it supports other life. Over time, the saguaro disappears from the landscape, leaving little trace of its existence. The components from a cell phone – circuit boards, screens, plastics – may take multiple human lifetimes before they start degrading. What if our products are made from materials and technologies that, like the saguaro, vanish when their useful lives are over? Maybe we can learn about waste management from nature, where one organism’s refuse serves as another organism’s raw material. An ecosystem does not need landfills for animal droppings, decaying fruit or dead creatures. It has dung beetles, microbes and vultures that will gladly take care of it all. Biomimicry can help us in carefully observing and learning from organisms and ecosystems so that we may create more sustainable solutions to address our most complex problems. Biomimicry can serve as the bridge that links our natural and artificial worlds. Let us mine nature for ideas, not materials. Senior Sustainability Scientist Prasad Boradkar is co-director of the Biomimicry Center and director of InnovationSpace, teaching students how to develop products that create market value while serving real societal needs and minimizing impacts on the environment. Boradkar is a professor in The Design School, Herberger Institute for Design and the Arts, at ASU.